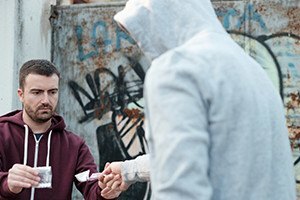 While possessing drugs in California is now a misdemeanor in many cases, selling drugs is still a serious drug crime offense that can result in lengthy prison sentences for those convicted. Methamphetamine is not one of the narcotics covered under California Health and Safety Code Section 11352 HSC, which prohibits the sale or transportation of heroin, cocaine, and certain opiates and prescription drugs. The sale or transportation of methamphetamine and other controlled substances such as MDMA/ecstasy, GHB and PCP is a felony under California Health and Safety Code Section 11379 HSC and those convicted can face extensive prison sentences. In order to convict a defendant for selling or transporting methamphetamine, the prosecution must be able to prove that the defendant transported, sold, furnished, administered, or gave away methamphetamine or a related controlled substances or offered to transport, sell, furnish, administer or give away one of the controlled substances specifically listed in California Health and Safety Code Section 11379 HSC. In order to convict a defendant under California Health and Safety Code Section 11379(b) HSC, the People would to prove that the defendant transported a drug with the intent to sell it over two county lines. A defendant convicted of selling or transporting methamphetamine can be sentenced to serve up to four years in prison. If the defendant is charged with transporting methamphetamine for sale over two county lines under California Health and Safety Code Section 11379(b) HSC, the maximum prison sentence increases to nine years. There are several defenses that may be available to a defendant who is charged with selling or transporting methamphetamine in violation of California Health and Safety Code Section 11379 HSC. In many cases, law enforcement agencies rely on undercover officers or decoys in order to catch people in the act of selling methamphetamine or ecstasy. If the decoy is overly aggressive in his or her attempts to get the defendant to commit a crime, the defense may be able to raise a successful entrapment defense. In many cases, the case may rely on evidence discovered during the execution of a search warrant. If the warrant was contained false information in the affidavit or if it was not properly executed, there may be grounds to exclude all of the evidence discovered as a result of that warrant. In some cases, the evidence of methamphetamine sales may have been discovered during a warrantless search or seizure. If the police lacked reasonable or probable cause when they searched the defendant or his or her home or vehicle, the defense can challenge the admissibility of the evidence by filing a motion to suppress under California Penal Code Section 1538.5 PC. If granted, the evidence will be thrown out and the prosecution will likely be unable to proceed with the criminal charges. Law enforcement agencies have recently increased their efforts to crack down on methamphetamine related crimes. In addition to selling methamphetamine, defendants can also be prosecuted for manufacturing methamphetamine under California Health and Safety Code Section 11379.6 HSC. It is also a felony to possess the materials required to manufacture methamphetamine pursuant to California Health and Safety Code Section 11383 and 11383.5 HSC. If you have been charged with selling or transporting methamphetamine, it is crucial that you speak with an skilled drug crime attorney as soon as possible. As a former Deputy District Attorney with over 14 years of prosecutorial experience, Michael Kraut understands how to effectively defend clients who are charged drug offenses. Mr. Kraut works hard to ensure his clients receive the best defense possible. For more information about selling or transporting methamphetamine, and to schedule your free consultation, contact Michael Kraut at the Kraut Law Group located at 6255 Sunset Boulevard, Suite 1480, Los Angeles, CA 90028. Mr. Kraut can be reached 24/7 at 888-334-6344 or 323-464-6453.